Your hands are precision tools that need to be taken care of. Your hands are vital, to be injured or worse, loose such a valuable and complex tool would be devastating. With a serious hand injury or the loss of your hands you would be unable to carry out the thousands of activities you take for granted today. With today's myriad of industrial hand protection options out there, how do you tell a quality glove that will provide you the protection you need? 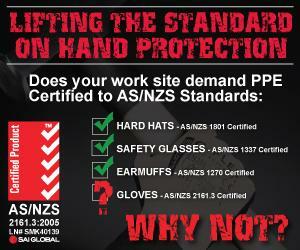 Australian/ New Zealand Standards helps making the choice of which brand of personal protective equipment to choose very simple. It helps you ensure you are getting the very best and safest protection for your workers. "Look at you safety helmet, safety glasses, respiratory and hearing protection, they are all certified to AS/NZS Standards, says Anthony Elliott, Managing Director of Elliotts. No employer or serious safety professional would specify either one of those products if they were not certified to the appropriate Australian Standard." By purchasing products that are not made to meet the requirements of a standard increase the risk of both injury to employees and prosecution by the relevant safety authority. Hand and wrist injuries are one of the most common work-related injury sustained in Australia, and cause a significant problem in certain workplaces. The introduction of a requirement for certification to AS/NZS Standards for gloves, as industry does for eyewear, hearing and respiratory could help reduce the frequency of hand and wrist injuries. Many Gloves and other Personal Protective Equipment (PPE) claim compliance to a standard, how do you know that firstly the testing has been conducted, that the factory is consistently making the product to the same standard and that the product is re tested on a regular basis? Some manufacturers claim compliance to a standard, or claim that their product is manufactured to meet the requirements of a standard. This is not the same as "Certified" to a standard. All test certificates specified in the appropriate standard which have been conducted by an accredited independent third party testing laboratory. The manufacturing facility has to undergo an audit to ensure systems and procedures also comply with the appropriate standards. The manufacturing facility must undergo an annual audit by the same third party. Product must be re tested on a regular basis. This provides the End Users and Employer with peace of mind that the PPE will provide the protection it claims. We are passionate about taking care of people with quality safety gear. We have always been committed to product certification and have protective products and clothing certified to seven different Australian/ New Zealand standards over 12 manufacturing sites around the world. Information on Elliotts and their products can be found at www.elliottaustralia.com.